Heraklion Youth Hostel is located right in the heart of the town yet in a nice and quiet neighborhood. A family-run business offering basic and cheap accommodation all year long. The main tourist sights and means of transport are only few minutes away together with numerous choices of entertainment. 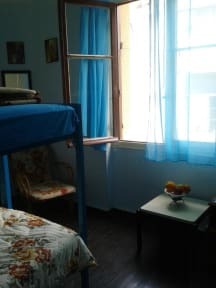 The hostel is in a two storey neo-classical stone building, that makes it cool in summer and warm in winter, and has sunny fresh rooms (balcony or windows) with air-condition. There are males and females dormitory rooms. Our guests can enjoy all day long hot showers, cooking facilities (cooker, microwave oven, fridge, freezer, coffee makers, boilers) to prepare their own drink or meal, leave their luggage for free and have free wi-fi access. Safety lockers, safety box, adaptors, city brochures and maps are also available. Guests can also rest at the beautiful patio and relax at the sunbeds there are at the top floor spacious sunny terrace. A friendly, multi-lingual staff is always here to help you explore the town, arrange excursions around the island and make your stay easier and far more interesting. Being in a very central, still quiet position allows you to follow the beat of the town and not miss a thing as everything is within a short -walking usually- distance. If you wish to change or cancel your booking, please inform us at least one day in advance. Failure to cancel within this time will result in a cancellation charge equal to the first night of your stay. Please, be aware that the hostel opens at 07:30 in the morning and closes after midnight, at 1 a.m. In case you are arriving with a late flight, please make sure you contact us before so you let us know. Located downtown close to shopping malls, supermarkets, sights, harbor, Venetian fort, KTEL bus station, museum, laundry, & local bus station. Ideal to go visit the Knossos Palace ruins via local bus #2. The KTEL buses , by contrast , can take you to the rest of Crete. The Hostel has a kitchen, common bathrooms, lockers, and double bunks at a bargain price. The proprietress is kind & helpful. Highly recommended. Great location close to the city center and within walking distance of the port. Clean and simple facilities, friendly and helpful staff. Great bang for your buck! Friendly staff! This hostel is an easy to meet likeminded travellers. Rooftop and outside chill /wash up area was unique. Locker supplied in room. Close to centre and the harbour. Short walk to super market, bus stop and ferry port. If you plan on going out all night (past1am), make sure you grab the main door key before you leave. I would stay here again. I had a lovely time staying here. The hostel was reasonably clean. I believe the sink and outside kitchen could be better looked after as it wasn't very clean or organised. The hosts were very friendly and helpful. Always had a smile. Other guests on the hostel were super friendly and social. The upstairs rooftop was pretty cool and great place for afternoon drinks. In a fabulous location, just off the main street! El hostal esta muy bien ubicado, los dueños son muy amables y responderan a todas tus dudas. Sin embargo ofrecen cocina pero esta poco equipada. Las piezas son amplias y comodas, el unico detalles es que al lado de cada cama no hay enchufes. Rundown & pretty dingy & creepy at night, kitchen & bathrooms felt dirty. Like camping, but inside. Lots of weird beds on the roof. Lots of older men, but also met some very nice normal people. Curfew & they hold your passport until you return linens & key. Left after one night & went to So Young Bed Station around the corner. Worth the few extra Euro for sure. This hostel is good if your plan is live the day. They have Curfew. Good rooftop, no bar, no really good kitchen but enough. The best of this hostel: is location, prize and rooftop to relax. Staff were short and not very helpful at making any sort of recommendations. The dorm I stayed in was dirty and smelled horribly each night. Not a very social environment.